Almost all the published books on digital preservation are academic writing for a very limited audience. My own Files that Last wasn’t intended for a tiny audience but ended up that way. 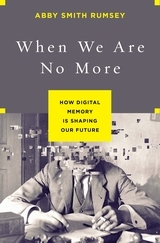 The chances look better for Abby Smith Rumsey’s upcoming When We Are No More: How Digital Memory Is Shaping Our Future . According to the website description, she writes about the long term, looking at how information was stored thousands of years ago and how people thousands of years in the future will be able to read today’s information. It includes some paradoxical statements which the book hopefully clarifies: “why data storage is not memory; why forgetting is the first step towards remembering; and above all, why memory is about the future, not the past.” We’re already living with paradoxes; one of the biggest is that the Babylonians’ information storage technology was much more durable than what we use today. This book looks worth picking up. This entry was posted in News and tagged books, preservation. Bookmark the permalink.